It does a better job at saying "attention here, please" than the old icon which was almost indiscernible, and certainly easily ignored. What it doesn't do is tell me any useful information behind the alert. It's obvious that Shog's request is not being implemented (yet), but I'm curious about the logic behind this new look. Does the red icon light up via the same logic as before? E.g. when the review queues haven't been visited in an hour. Or does it light up when a particular queue is full to a certain threshold? I ask because only some of the queues have red dots next to them in the new dropdown style. Also, if I have used up all my reviews in total, or for a given queue, will the red dot still appear for me if I have not visited the queues in a while? It would be a bit annoying to see a red dot for the CV queue if I have done 40 reviews already. Or does it light up when a particular queue is full to a certain threshold? This. Currently the thresholds are based on 90% of the max hourly value over the past couple weeks (test is done, thresholds now aspirational - see below); we'll adjust those based on the initial test results in an effort to determine if that'll help with prioritization and, uh, indicator blindness. Kudos to the many people who suggested something like this in response to my previous thread on the matter; if it doesn't work I'm holding you all personally responsible. 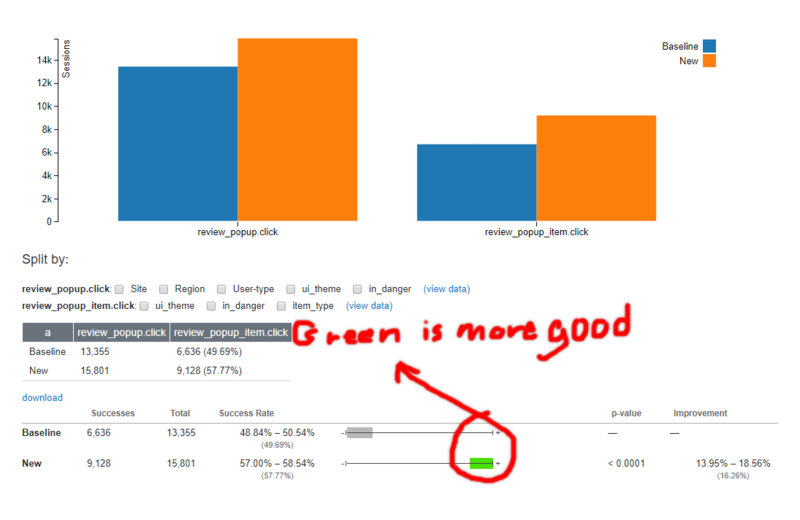 The results over nearly a month of testing were pretty conclusive: the new indicator draws more people to click the button and to click through to specific queues once the drop-down is displayed. But don't believe me - believe this screenshot of our funky internal testing tool! Thanks again to everyone who suggested this, and especially those who patiently suffered with seemingly-random UI changes while the test was underway. Just in case anyone decides that the lack of any useful information behind the alert is enough of a reason to want to hide the redness altogether, @Glorfindel made a nice little script that hides exactly that part of the CSS over here. Of course, at some point your wishes may be granted in a more constructive fashion - so be sure to disable it now and then so you don't miss any improvements. Not the answer you're looking for? 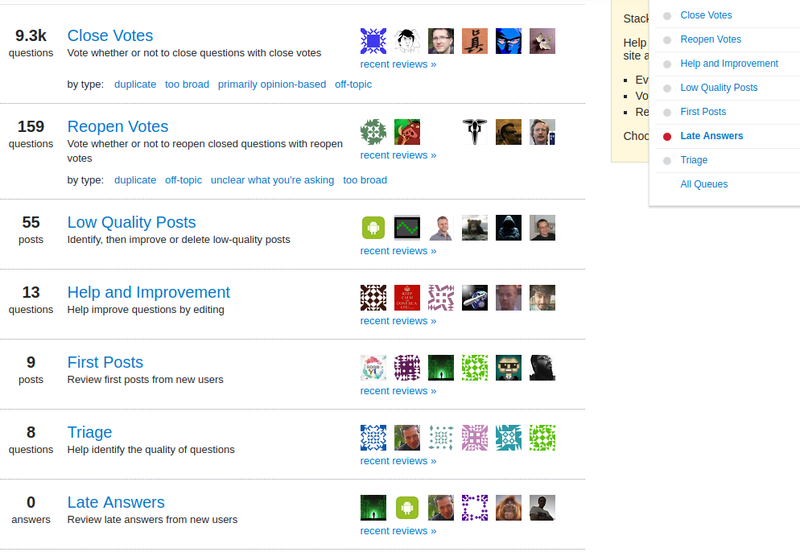 Browse other questions tagged support review design top-bar a-b-testing . What do the different dots next to the review queues mean? 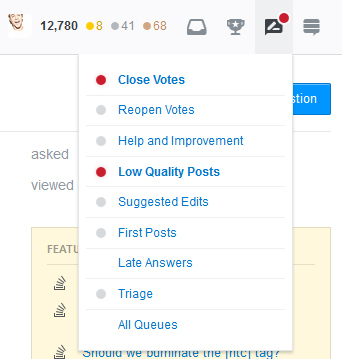 Is there a new notification feature for closed votes?